Daphne Pineda is an analyst at AIG who has recently taken up golf and is working on her game with Teaching Professional Randy Taylor at The Bridge Golf Learning Center in Harlem. In his native Puerto Rico, Lukas Rosario often hopped on his bike and headed to Punta Borinquen Golf Club. In New York, he's found a new home for his golf game at The Bridge Golf Learning Center. Brian Hwang shows you how to hit a knockdown wedge with a low, penetrating ball flight on those tricky downhill par 3s. After a personal record drive of 210 yards, Blake Wilson put his second shot on the green on No. 1 at Banff Springs during a recent after school session. Many amateurs dread the thin chip, devoid of touch or control, that shoots off the green. Here's how to avoid it. 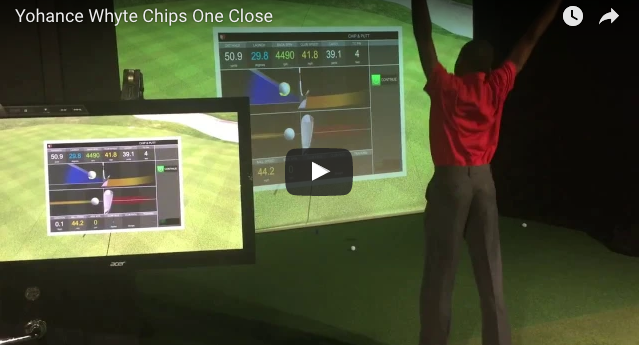 New York has always been a tough environment for golfers, but simulator technology has made it possible to get top-notch golf lessons in Manhattan, even when the weather is rough. TrackMan is hosting a worldwide competition to identify the world's best shotmaker, and you can enter by completing a TrackMan Combine at our Learning Center. Many golfers struggle to hit high, soft chip shots with enough spin to hold the green. Here's how it's done. Here's a nice moment from a recent after school practice session, when Yohance Whyte hit a chip to 4 feet.